Scott Sanders, a player from Santa Clara, California, was the Thursday night star at Harveys Lake Tahoe Casino as he navigated through the field of the $400 No-Limit Hold’em Monster Stack, or Event #8 on the WSOP Circuit Harveys Lake Tahoe schedule, to eventually emerge as the victor and collect his first gold ring from the major poker series. 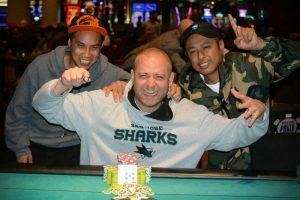 Sanders also claimed a first-place monetary prize of $25,201 as an additional reward for his great performance at the tables of the host venue. The player was one of the 332 competitors to register into the two-day Monster Stack tournament. And he was the player to collect the lion’s share of the $109,560 prize pool. While the majority of entries left empty-handed, there were others, besides Sanders, to claim a portion of the prize pool. The top 36 finishers received a payout from the tournament, with in-cashes being worth $566. 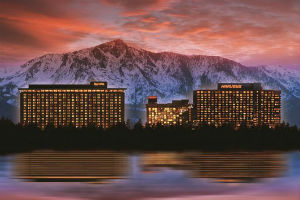 The event’s final day was played Thursday at the host casino. It kicked off with 13 hopefuls, all eyeing the gold ring and the first-place prize. When the unofficial final table of ten was reached, Sanders was about mid-stacked with 1 million in chips. He managed to improve his stack and to avoid elimination to eventually make it to heads-up against Marty Gorenc from Reno, Nevada. While playing heads-up for a WSOP Circuit gold ring can certainly be a bit stressful, neither Sanders, nor his final opponent showed any signs of stress when they faced each other for a final battle for the title. There was a great amount of banter at the table, fans’ excitement, and a couple of drinks for additional fun, before Sanders sealed the victory with [Ah][9c] on what turned out to be the final hand of the night. Gorenc scooped a consolation prize of $15,578 for his runner-up finish. Of his approach to poker, the brand-new WSOP Circuit champion said last night that if players “don’t have fun then poker will never grow” and that his main goal is namely to grow poker. This is why Sanders has been looking to make poker fun so people keep playing the game he loves. Sanders’ latest cash from the WSOP Circuit brought his earnings from the series to over $100,000. But his first-place prize last night was not his largest-ever cash from the circuit. Last year, Sanders finished third in the $580 No-Limit Hold’em Re-Entry (Muti-Flight) at Seminole Hard Rock Casino in Hollywood for a cash prize of $62,255. The player has so far cashed in eight WSOP Circuit tournaments, but he is certainly eyeing more titles and deep runs in the series.